Bloomberg has an interesting story today about how hedge funds are currently enforcing their own kind of "credit crunch" on Russian corporate debt. According to Bloomberg more than 200 companies are currently being forced to increase the interest they pay to as much as 16 percent. Following Russia's debt default a decade ago investors were lured back to Russia on the basis of put options giving them the right to redeem debt. Just this sort of option has forced Khanty-Mansiysk-based auto-leasing firm Ugra Leasing to raise the yield in April on 1 billion rubles ($42.4 million) of three-year notes sold last year to 16 percent from 14 percent, according to Bloomberg data. Moscow-based supermarket chain Mosmart also was forced to increase the coupon on 2 billion rubles of bonds from 11 percent to 15.5 percent. According to the article hedge fund Argo Capital Management (which oversees around $1 billion of emerging market debt) rejected an offer from Moscow-based retailer Samokhval last month to increase interest to 14.5 percent from 11.4 percent, choosing instead to redeem bonds due in 2009. Even with record oil prices pumping the economy, the global credit crunch is penalizing Russian borrowers as the put options leave companies liable for refinancing nearly a third of their 1.5 trillion rubles of bonds at higher rates by yearend according to Bloomberg. Put options give bondholders the right to demand payment at face value on a set date. They became more common in Russia than anywhere else after the Russian government's $40 billion default in 1998 led to almost $4 billion of losses for Long-Term Capital Management, a development which effectively forced the Federal Reserve to organize a rescue of the fund. Investors rarely exercised the puts until last year because the interest they received was higher than what they could get on new bonds. The oil-led economic boom drove down the average corporate yield to 7 percent from 12 percent between 2004 and the middle of last year. Alfa Bank, Russia's biggest private lender, had to raise the annual rate on 2 billion rubles of bonds due in 2010 by 3.6 percentage points to 9.5 percent last month to prevent holders from using puts to redeem the debt, according to Bloomberg. State-owned VTB Group, Russia's second-largest bank, lifted interest on 15 billion rubles of notes maturing 2013 to 8.6 percent from 5.9 percent last month. Soaring oil prices have helped Russia win back investors as the government built up the world's third-largest pool of foreign- currency reserves at $540 billion. Companies followed with 518 billion rubles of bond sales in 2006 and a record 520 billion rubles last year, according to Bloomberg data. As investor confidence improved, companies began selling bonds lacking put options. Citigroup Inc. arranged a sale of 3 billion rubles of 10.05 percent five-year debt without the feature for regional lender Ursa Bank in 2006. Since then, worsening credit conditions meant that Russia's 17th-largest lender by assets last month had to offer a one-year put in a sale of 10 billion rubles of seven-year notes yielding 11.19 percent. Ruble bond sales slowed 15 percent in the first quarter to 111 billion rubles as hedge funds and others reduced holdings of riskier assets worldwide, Bloomberg data show. The ruble strengthened today to 23.6193 per dollar, compared with 25.8889 per dollar a year earlier. Companies have 420 billion rubles of bonds with put options due between May and yearend, Bloomberg data show. Investors may redeem as much as 80 percent of so-called junk bonds on the put dates, said Nikolai Podguzov, a fixed-income analyst at Moscow- based investment bank Renaissance Capital. Investors may demand repayment of as much as 40 percent of bonds rated investment-grade, or Baa3 and above by Moody's Investors Service and BBB- by S&P. Russian consumer prices may have risen 1.2 percent in May, the Finance Ministry official in charge of forecasts said this morning. The rate for the first five months of the year will probably be 7.6 percent, according to Oksana Sergiyenko, director of the ministry's long-term planning department. The ministry is seeking to keep spending growth no higher than the pace of economic growth, she said. ``We made it our goal to abide by this rule,'' she said, adding that the ministry would present a plan for economic development through 2023, including spending targets, to the government on Aug. 1. Government spending increased 40 percent last year, while the economy expanded 8.1 percent. Net capital inflows for May will reach at least $15 billion and no less than $41 billion for whole year 2008, according to Sergiyenko. Bank Rossii, Russia's central bank, have stated this morning that they are "concerned'' by the pace of corporate lending, according to a Kommersant report. First Deputy Chairman Gennady Melikyan is quopted as saying ``Let's slow down a gear....This can end badly.'' at the annual meeting of the Association of Regional Banks. The amount of loans to companies increased by 14 percent in the first quarter from the previous three months and may grow 50 percent this year, Melikyan said, according to Kommersant. Russian banks lent companies $55 billion in the first quarter, while luring $27 billion in corporate deposits and $16 billion in consumer deposits....... the discrepancy forces banks to increase short-term interbank borrowing using securities as collateral, the newspaper said. It was also announced today - this time by the Agriculture Ministry - that Russian farmers have planted 82 percent of the spring grain crop for this year. About 25.5 million hectares (63 million acres) had been sown with spring grains by May 26, or 3 million hectares more than a year before, the ministry said in a statement today. Stocks fell to 16.4 million metric tons of grain as of May 1 from 17.1 million tons a year earlier, Sergei Sukhov, head of the ministry's regulatory department, told reporters in Moscow today. Stocks are ``a bit lower than we expected'' because more grain was used for sowing this season, Sukhov said. 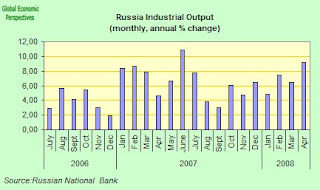 Russian foreign direct investment fell 42.8 percent in the first quarter of 2008. Direct investment totaled $5.59 billion, while total foreign investment, including credits and flows into the securities markets, was $17.3 billion, or 30 percent less than in the first quarter last year, the Moscow-based Federal Statistics Service said today. Foreign investment in stocks and bonds fell 44 percent to $107 million, it said. Foreign direct investment doubled last year to $27.8 billion as economic growth fueled a boom in consumption and attracted investors. Russian GDP rose 8.1 percent last year, the highest since 2000. The retail industry, including automotive and household good repairs, received the largest amount of investment, according to the Statistics Service. Foreign investors put $5.47 billion into Russian industry, including stock and bond purchases, the statistics office said. Russia's 10th year of economic growth is alos producing a construction boom, boosting demand for new apartments and offices, with builders rapidly renewing the old Soviet-built housing stock. Brick production climbed by 11 percent in April, while crane output more than doubled and steel panel construction more than tripled, the service said. Oil production, on the other hand, which Russia's greatest single source of revenue, declined 0.7 percent in April from a year earlier. Is there a lesson hidden away here somewhere? 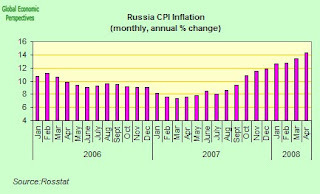 Russia's inflation rate rose to 14.3 percent, the highest since April 2003, led by rising food costs. The inflation rate rose from 13.3 percent in March, while prices rose 1.4 percent in the month, compared with 1.2 percent in March, the Moscow-based Federal Statistics Service reported in an e-mailed statement today. The annual result matched the median forecast of 19 economists surveyed by Bloomberg. Prices increased 6.3 percent in the year through April. Well, I got a reasonably interesting comment on the post, so I though I would update adding my response, since I do think the issues raised are rather important ones. "Is there a particular reason the decline in oil production is a bad thing for Russia?" Well yes there is really, but to see why we need to think in the slightly longer term - let's say 5 to 10 years. From the point of view of the Russian economy as a whole the oil sector constitutes relatively "easy money" (I'm sure you won't feel this though if you actually work in the industry out in Siberia, or are one of those who is likely to be involved in developing the Yamal peninsula resources). What I mean by this is that in the short term Russia can close some of the living standards gap with the OECD simply on the basis of oil money, and the secondary derivitive activities of construction (as people buy houses etc) and financial services (the loans and mortgages to float the new life style) - ie a consumer boom. What gets missed out in all of this in the short term is the development of a competitive industrial base which can make the economy sustainable in the longer term, since all the inflation we are seeing is just choking this off. This is the core of my argument. Now, if we look around the OECD countries right now we can see that the construction driven consumer credit boom leg for economic growth is completely unsatisfactory on its own account - viz the US, the UK, Spain, Ireland etc now, Japan 1992, Germany 1995. So at some point this internal momentum will seize up, as we have seen and are seeing elsewhere. Now if when it does seize up you don't have the capacity Japan and Germany have had to "re-invent themselves" as strong export driven economies then you have real difficulties sustaining economic growth (as we have been seeing over the last 10 years in Italy. Italy's construction driven component also peaked out in the mid 1990s, and Italy now has a congenital competitivesness problem). So this is where the oil starting to decline (or at least become more and more costly and difficult to extract) could become a problem. If Russia has not by the time oil starts to become more problematic as a source of revenue developed the necessary industrial capacity to survive in this new economic environment then things can become very complicated and difficult. "A decline in oil production would cut down on that "Too much money chasing too few workers" thing, ya know." This is not so simple as it seems, since strong bouts of inflation can be followed by severe bouts of deflation, which is of course "too little money chasing too many people, and too many dollar bills stashed away in mattresses". I think the key point is that Russia's population is not simply declining, it is declining and AGEING. So Russia is going to have a much higher elderly dependent ratio twenty years from now. This population will need to be supported, and to offer this support you need economic growth, and again this is where the presence or absence of an industrial base (and high tech agriculture I suspect in the Russian case) becomes important. Last week Claus Vistesen posted something on the Demography Matters blog about Germany, and at the end of the piece he cites recent research by McKinsey (and other sources) which tend to suggest that between now and 2020 a further 10 percent of the German population can fall into poverty just due to the effect of ageing alone. Obviously Germany is a lot richer than Russia. Just imagine what happens once all this starts happening in Russia. Is The Ruble Set To Rise? Speculation is mounting that one of the first policy decisions Dmitry Medvedev take after he's sworn in as Russia's president this week is to allow a stronger currency. Merrill Lynch, Goldman Sachs and Deutsche Bank are predicting gains of as much as 4 percent over the next six months. They say pressure will mount on the central bank to let the ruble appreciate to stem inflation even if it risks damping profits of oil and energy exporters, which according to Merrill Lynch fund more than half of the federal budget. The last time Bank Rossii allowed the ruble to strengthen was in August, when the inflation rate was 8.5 percent. It's now at 13.3 percent, and may well still be rising. The central bank sets the price of the ruble against a so- called currency basket made up of 0.55 dollars and 0.45 euros. It let the currency appreciate against the basket three times last year by a total of about 1.3 percent. The ruble traded at 36.8220 per euro and 23.7560 per dollar at 1:31 p.m.today in Tokyo. The central bank also estimates the pass-through rate - or the rate at which and increase in the ruble would cut inflation - to be 0.3, that is to say a 1 percentage point increase in the ruble against the currency basket would cut inflation by 0.3 percentage points. Russia, which is the world's second-largest oil supplier, produced the lowest volume of crude in 18 months in April as ageing fields and rising costs threaten the country with the first annual decline in oil output in a decade. Production dropped to 9.72 million barrels a day (39.8 million metric tons a month), 0.8 percent less than in April last year and only slightly higher than in October 2006, according to data released today by CDU TEK, the dispatch center for the Energy Ministry. Compared with March, output fell 0.4 percent. The harsh reality is that Russia's output may have peaked as producers struggle with aging fields, rising costs and increasingly remote new deposits. The finance and energy ministries are working on tax-cut proposals by July in a last ditch attempt to stimulate investment. Exports through OAO Transneft, the state oil-pipeline operator, increased 6.7 percent from March to 4.5 million barrels a day. Russia increased the crude export tax to a record $340.10 a metric ton ($46.53 a barrel) on April 1 and plans to raise the levy again as of June 1. Exports dropped 3.8 percent compared with April last year. Production from Lukoil, OAO Surgutneftegaz and Exxon Mobil Corp.'s Sakhalin-1 project continued to decline. State-run OAO Rosneft, which boosted output by about a third after buying bankrupt OAO Yukos Oil Co.'s assets last year, produced 2.29 million barrels of oil, 0.3 percent more than in March. Lukoil pumped 1.79 million barrels a day last month, 0.6 percent less than in March and 2.7 percent less than in April last year. The company cut its growth target to 1.5 percent this year after delays starting the Yuzhno-Khylchuyusskoye field in the Timan-Pechora region. Sakhalin-1, in which Rosneft owns a stake, pumped 204,900 barrels a day, 2.8 percent less than in March and 8.1 percent less than last year. The project, off Sakhalin Island to the north of Japan, averaged 225,000 barrels of oil a day last year. The Exxon Mobil-led project, where production peaked last year, helped Russia boost output 2.2 percent in 2007. The project may pump 29 percent less oil this year, as the Chaivo field goes into decline and OAO Gazprom holds up sales of the project's natural gas to China, a Rosneft official said in February. TNK-BP, the Russian venture that accounts for a quarter of BP Plc's output, pumped 1.57 million barrels a day last month, 0.3 percent more than in March, although 2.8 percent less than in April last year. OAO Slavneft, which TNK-BP owns equally with state-run OAO Gazprom, continued to decline. Gazprom's oil arm, OAO Gazprom Neft, said earlier this month it will more than double crude output by 2020 to about 100 million tons a year through acquisitions of existing producers and new licenses.The unit pumped 816,000 barrels in April, including Slavneft, 0.7 percent less than in March and 6.5 percent less than a year earlier. Surgutneftegaz, Russia's third-largest independent oil company, produced 1.23 million barrels a day, little changed from March and 5.4 percent less than in 2007. For Russia'a output to increase in the long-term, massive investments are needed to develop fresh deposits in western Siberia and to tap more remote provinces in eastern Siberia and the Arctic. Leonid Fedun, Lukoil vice-president, says Russia needs about $300bn in investment during the next eight years simply to keep production at current levels. 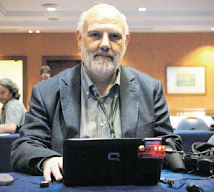 But many projects are being held back by a difficult fiscal and political regime that began with the break up of Mikhail Khodorkovsky’s Yukos by the Russian state after the tycoon’s arrest in 2003 over tax charges. Another problem is access to new fields, which is limited by a new law to companies with more than 51 per cent Russian participation. The process of handing out licences for these fields has been delayed for years while the state determines how many of them are to be considered “strategic”. The state takeover of Yukos led to uncertainty about the investment climate as other private companies were picked off by the state. Russneft had been Russia’s fastest growing oil major until last year, when its owner, Mikhail Gutseriyev, fell on the wrong side of the authorities and fled Russia for the UK with a warrant out for his arrest. The company, which Mr Gutseriyev had developed from scratch in 2002 to produce 300,000 barrels per day, is now in administrative limbo, allegedly owing more than $800m in back taxes. Since Yuganskneftegaz, Yukos’ main production asset, was taken over by Rosneft, the state-controlled oil major, in December 2004, the state’s direct and indirect share of the oil industry has risen to more than 50 per cent from 28 per cent, according to Chris Weafer, chief strategist at Uralsib investment bank in Moscow. The takeovers by Gazprom and Rosneft have used up funds that otherwise could have been spent developing fresh fields, says Vladimir Milov, a former deputy energy minister who now heads a think-tank about energy policy. Since 2003, direct investment in Russia’s oil industry has not kept pace with the more than three-fold increase in oil prices. Fears about a production decline have spurred the government to review the tax regime, which takes more than 80 per cent of revenues of more than $27 per barrel. Ivan Mazalov of Prosperity Capital Management, an investment fund, calculates that, with oil prices at $110 a barrel, oil companies operating in Russia’s core production area of west Siberia see net income of only about $11 a barrel after taxes, export duties, operating and transportation costs. An offer by Alexei Kudrin, finance minister, of $4bn in tax cuts per year “is nowhere near enough in itself to right the problems”, says Ronald Smith, of Alfa Bank in Moscow. Mr Smith reckons the government could rectify the problem by increasing export tariffs on oil products, which are set at such a level to send refining margins “off the charts” while lowering tariffs on crude. But at fields in east Siberia, such as Surgutneftegaz’s Talakan venture and Rosneft’s Vankor, big tax breaks have already been won for the first oil extracted. Russian manufacturing expanded at the slowest pace in six months in April as new orders fell and inflation accelerated according to the VTB Bank Europe's Purchasing Managers' Index, which fell to 53 from 54.6 in March, the lowest level since the 52.9 reading registered last October. A figure above 50 indicates growth, below 50 a contraction. The bank surveyed 300 purchasing executives in order to compile the index. President Vladimir Putin told the Cabinet last month to pay ``close'' attention to the strengthening of the ruble against the dollar. The strength of the currency is making imports cheaper relative to domestically-produced goods, putting pressure on Russian manufacturers. The ruble has climbed 4 percent against the U.S. dollar this year. Imports account for an estimated 49 percent of the local retail market, highlighting the need to boost domestic production, Prime Minister Viktor Zubkov said on April 8. Russian manufacturers faced ``severe upward pressure on their purchasing costs in April,'' VTB also said in the statement. 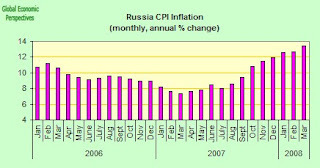 However allowing the ruble to rise is desireable since Russia is suffering from acute inflation at the present time - inflation accelerated to an annual 13.3 percent in March, the fastest pace in more than 2 1/2 years - and a rising currency can to some extent offset the upward trend in prices. However if the underlying dynamic behind the price rises - which appears to be intimately associated with labour shortages associated with Russia's rather special demography - is not addressed, then letting the ruble rise will simply serve to take away price competitiveness from domestic manufacturing industry, a process whose consequences we may be already starting to see. Russia could raise its grain production fourfold by better crop management and returning fallow land to cultivation, Richard Ferguson, an analyst at Nomura Holdings, argues today in the Financial Times. Russia has some 40 million hectares (99 million acres) of land lying fallow, equal to 50 percent of the area being cultivated, according to Ferguson. The land yields 2 metric tons of wheat per hectare and has the potential to yield 5 tons, he said. He argues that better management and more farming could increase Russia's production of cereal crops to 300 million tons a year, compared with 75 million tons now. I am sure he knows what he is talking about here, but the point that strikes me, as I argue at much greater length in my "Food Prices, Farmland, Global Rebalancing and Rural Labour Shortages" post on the demography Matters blog. Fundamental demand increases will likely be met by countries with highly fertile but under-utilised land. Russia, Ukraine and Kazakhstan top the list of beneficiaries of this changing landscape. Consider Russia. In 1992 the country had 120m hectares of farmland under cultivation. The change from public to private ownership ensured that one of the few advantages of communal ownership – access to plant and equipment – was lost. Multiple ownership resulted in a “free rider” dilemma for the new owners of land ie, the efforts of individual contributions are shared equally. Consequently, in the last 15 years, some 40m hectares of rich farmland have lain fallow. And what is farmed is low yielding. Russia grows some two tons of wheat per hectare when it has the potential to produce five tons of wheat per hectare. The ramifications are significant. From 75m tons of cereal output in 2007, Russia could multiply its grain output several-fold simply by enhancing yield management and bringing fallow land back into production. It could produce some 300m tons of cereals without the necessity of producing on virgin land. This requires long-term planning and investment. Transferring ownership from inefficient multiple parties with no access to capital to large-scale corporate entities with long-term funding is time-consuming, while repairing fallow land is expensive. To attain higher yields needs lengthy investment in crop rotation. Overall the process can take 4-6 years. These changes will help restore supply and demand imbalances across key cereal markets. That said, the entrepreneurial zeal transforming the Russian agricultural landscape will only restore some equilibrium to a dynamic market. So, while wheat at $12 a bushel might prove to have been a temporary blip, $4.50 a bushel is unlikely to be seen any time soon – even if it rains again in Australia one day.